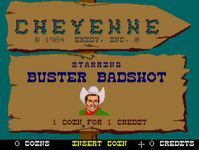 Cheyenne was an Exidy light gun arcade game released in 1984. In this western style shooting game, the player had to guide and protect "Buster Badshot" through various scenes of danger that take place in the old west, using the light gun. As well as keeping the character alive, the player had to kill the wanted bandits for each level. An NES port by American Game Cartridges was planned to be released but it never was. Additionally, this game is very closely related to Crossbow. Both are very fun games. Source: Wikipedia, "Cheyenne (video game)", available under the CC-BY-SA License.